Details about Meade Series 5000 18mm HD-60 6-Element Eyepiece, 1.25""
For a few years, I had just been using the standard Plossl eyepieces that came with my telescope. While they weren't bad eyepieces, they definitely weren't the best, especially the short focal length ones. 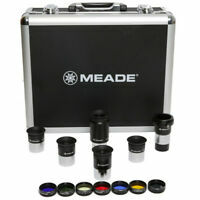 I finally decided that I was getting serious enough that I should upgrade my eyepieces and after hours of research, I finally settled on the Meade HD-60 eyepieces. I ended up getting the 25mm, the 18mm, and the 6.5mm. Coupled with a nice 2x Barlow lens, these eyepieces would give me a wide range of focal lengths and magnifications. The most important aspect that I considered when looking for eyepieces was eye relief since I often use glasses when observing. These eyepieces all have an eye relief of 17mm which is very nice, especially for short focal lengths. 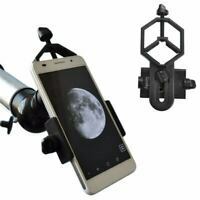 Being able to view the subject without having to jam your eye right up to the eyepiece is a serious plus and also makes it much easier for inexperienced observers to view with ease. Secondly, I wanted eyepieces that a flat-field optical design, meaning that stars near the edge of the FOV would still be in focus and not appear distorted. This is a big problem with low-cost eyepieces when coupled with a fast telescope like a Newtonian reflector which is what I use. These eyepieces cope very well with coma and although the 25mm definitely does display some coma, it is much less apparent than with a lower cost eyepiece. Finally, I wanted eyepieces that had a bit wider AFOV than standard Plossls. While 60 degrees is not a whole lot wider than 52 degrees it does make a notable difference and I think that it is good enough. 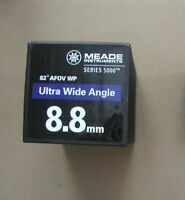 In the future when I hopefully have a bigger budget I can upgrade to eyepieces with an even wider AFOV. The build quality of these eyepieces is absolutely fantastic. They look and feel much more expensive than they really are. The 1.25" nosepiece has a security groove to ensure the eyepieces don't fall out of the focuser which is a must and the rubber eyecups fold down for use with glasses. While I would have preferred a twist style eyecup design for ease of use and durability, the rubber eyecups do the trick just fine. A nice plus that I discovered only after receiving the eyepieces was that they have a built-in eye relief adjustment. When the eyepiece is locked into the focuser you can twist the main body of the eyepiece to bring the objective further down away from your eye. This is useful for getting the optimal distance from your eye for best viewing. Overall, these eyepieces are a great upgrade from Plossl eyepieces for those on a budget. I expect to use the eyepieces for years to come. Excellent images, build, and quality.